Covington’s High Performance Lawn Fertilizer was developed based on research done by Texas A&M. It is a 25-0-0 slow release fertilizer with a great micro-nutrient package including a heavy dose of iron. It is a great fertilizer for lawns that have been fertilized regularly, NOTHING will turn your yard greener, and with no phosphorous to get in the storm water system you are doing something great for the environment as well. Our goal when we sat down to develop this controlled release fertilizer was to create a product that had everything that was great about Osmocote, and then to make it better for our unique soils of the metroplex. The primary difference is that Covington’s Premium Flower and Garden fertilizer has nearly 4x the iron content of the Osmocote brands. 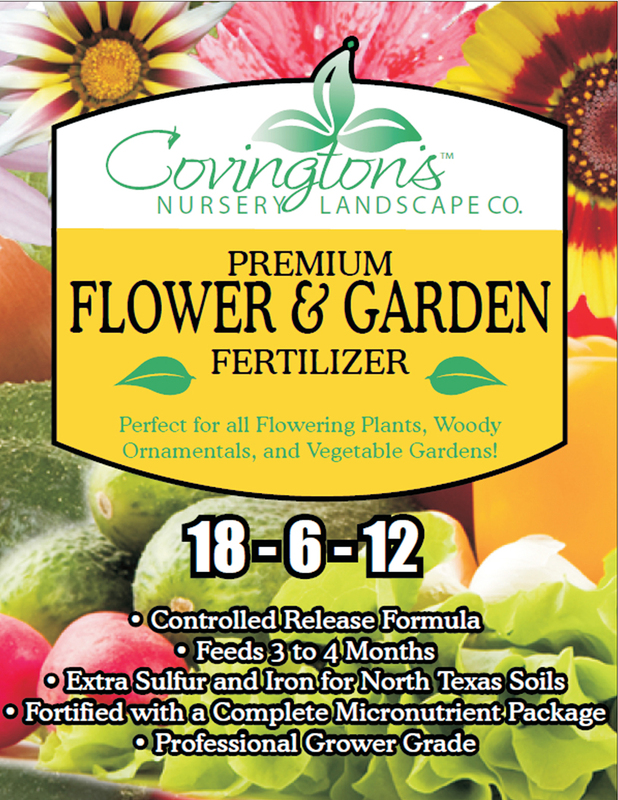 For the absolute best results with your flowers, veggies and herbs, use Covington’s Premium Flower and Garden Fertilizer. 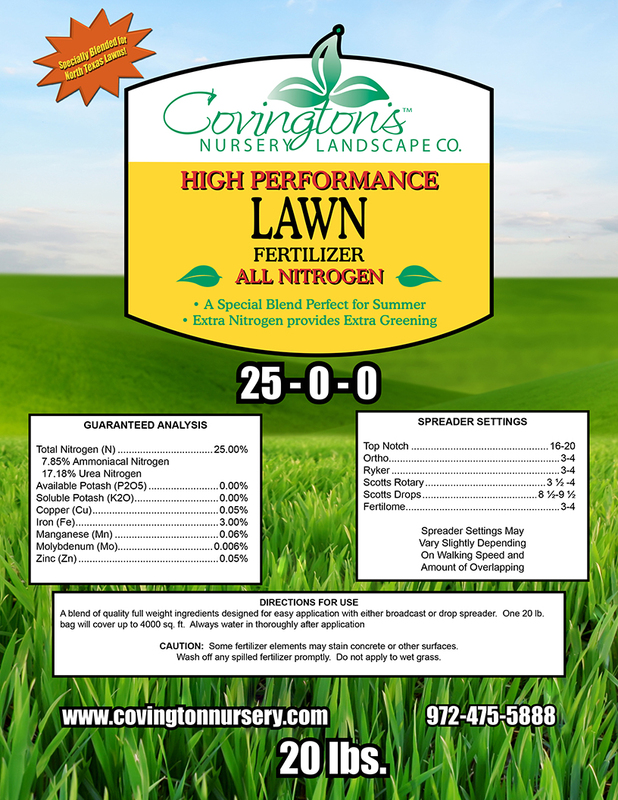 Covington’s Premium Lawn Fertilizer is a 21-7-14 lawn food that has a great micro-nutrient package with a heavy dose of iron and sulfur for our challenging clay soil. A mixture of fast and slow release nitrogen greens up lawns fast and keeps it green. 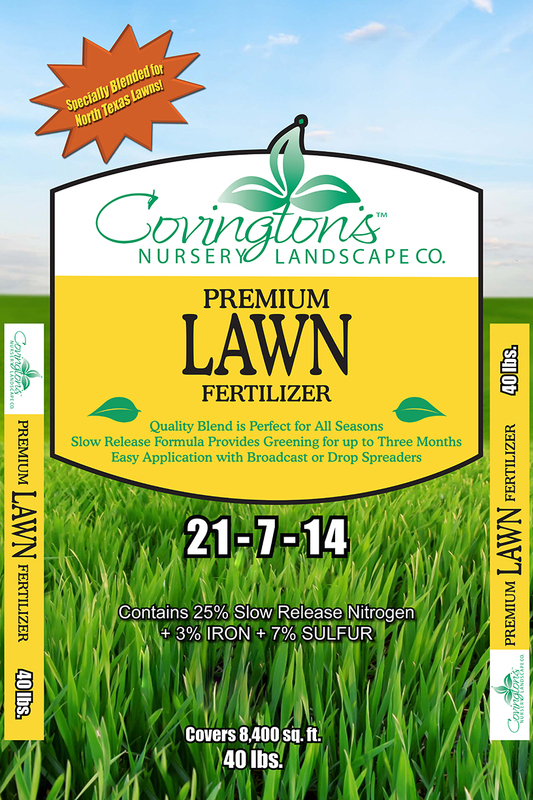 The Covington’s Premium Lawn Food is great for new lawns, and any lawn that has not been fertilized with regularity. 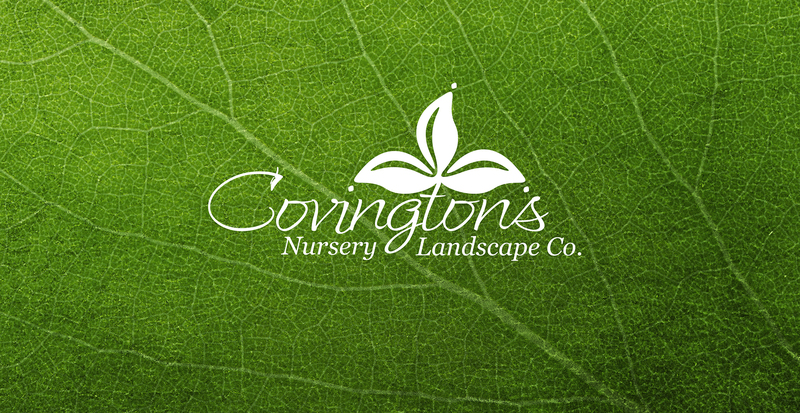 Covington’s Tree and Shrub Fertilizer was designed with our clay soils in mind. It is a slow release 12-6-6 fertilizer with a great micro-nutrient package including a heavy dose of iron. The perfect food for new and established landscapes. 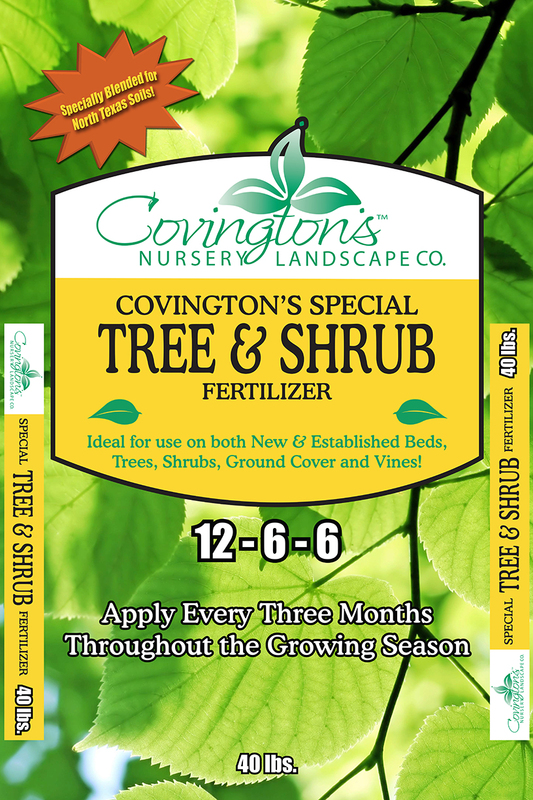 Feed your trees and shrubs with Covington’s Tree and Shrub fertilizer every 3 months during the growing season for best results.